Are you a Contractor or an Owner who has a CCIP or OCIP program? Are you concerned about rising workers’ compensation claims costs? Do you worry about the high cost and poor quality outcomes of surgeries for injuries sustained on the job by your employees, your contractors’ employees, your sub-contractors’ employees, that end up costing you more money when premium audits and insurance renewals come around, and that impact your claims severity and Experience Mod? If you answered yes to these questions, this article is for you. This is not a sales pitch, nor is it an advertisement for any particular product or service. What it is, is a way for you as a businessperson to learn about an alternative to high cost and poor quality medical care for injured workers that will actually save you and your insurance company money, which in the long-run will be beneficial to you, your carrier, your employees or your contractors’ employees. The alternative I am proposing is called many names; some people call it “Medical Tourism”, others call it “Medical Travel”, or “Health Travel”, or other similar names. For sake of convenience, we will call it Medical Tourism, despite the vacation-linked connotation the word “tourism” has. People are travelling all over the world seeking health care that is lower cost and with equal or better quality than what they can get at home for a myriad of procedures and treatments, mostly either not covered by private health insurance or unavailable in their country. The hospitals and clinics in these countries are accredited by the Joint Commission International (JCI), the international arm of the Joint Commission, which accredits US hospitals and other medical facilities. The doctors in most of these facilities have either been trained in the US, or in other Western countries, and the facilities are equipped with the latest medical technology found in today’s American hospitals. For over the past year, I have been writing a blog about implementing medical tourism into workers’ compensation because I believe that it can offer lower cost and high quality medical care to injured workers. Having now written over eighty blog articles on the subject, with topics ranging from Employee/Employer Choice, Immigration Reform, Rising Hospital Costs, and how workers’ compensation is charged more for certain surgeries that general health care is being charged for the same exact surgery, I believe that Contractors and Owners such as yourselves should look into this new and growing industry to help you save money. Much of medical tourism involves patients going to countries like India, Singapore, Thailand, and other countries in Asia, Europe, the Middle East, Australia, and even some places in Africa, like South Africa. However, I have been writing about implementing medical tourism for workers’ compensation in this hemisphere, particularly in Latin America and the Caribbean. In a follow-up to the Immigration Reform article, I wrote, Immigration and Workers’ Compensation: Round Two, and cited additional statistics on the changing makeup of the workforce in the US provided to me by two bloggers I have sourced in the past, Peter Rousmaniere and Joe Paduda. The following paragraphs from that article expound on the implications of the changing nature of the American workforce and what it means for workers’ compensation. “Joe’s post today, Immigrants in the workforce – and implications thereof, mentions that one of every seven workers in the US is foreign-born, and that about half are Hispanic and a quarter Asian. About a third of the foreign born workers are undocumented. Peter’s post, Foreign Born Workers Take Center Stage, in WorkCompWire.com, reiterates some of the statistics I mentioned in my posts on the subject, that foreign workers are skewed toward above average injury risk jobs, and sustain a large share of the nation’s annual three million work injuries. He goes on to add that in 2012, there were 25 million foreign-born persons in the U.S. labor force, comprising 16% of the total workforce. Hispanics accounted for 48% of the foreign-born labor force in 2012, and Asians accounted for 24%. (Recently Asians have been entering the U.S. at higher levels than Hispanics.) Undocumented workers account overall for about 5% of the nation’s total workforce and roughly one third of foreign-born workers. A foreign born worker poses higher injury risk due to language barriers, cultural miscues and poor health literacy. The growing presence of immigrant workers is not temporary and reversible. It is part of global economic forces. Some 150 million workers globally are estimated to be working outside their country of origin. Private sector employment growth has been and will continue be in fields with relatively high immigrant participation, ranging from software engineers to personal health aides. When you estimate the number of future work injuries, taking into account the injury rates of the individual jobs and their expected growth of openings, you find that immigrant workers will likely sustain 20% — one of every five – of work injuries. Most of these workers likely won’t know much about the US health care system or workers’ comp, and will get that information from people they know and trust – their fellow countrymen. Many may not have primary care physicians, so will seek care at the most convenient/nearest location. Based on these statistics, Latin American and the Caribbean is a logical place for medical tourism to be implemented into workers’ compensation. However, I am not the only one who has discussed the increasing Hispanic and foreign-born workforce and what challenges they present for workers’ compensation. A book published by Peter Rousmaniere with the assistance of Concentra and Broadspire, was reviewed this week by Tom Lynch of the Workers’ Comp Insider blog. The review entitled, Review: Work Safe: An Employer’s Guide to Safety and Health in a Diversified Workforce, points out that of the 15 occupations that are expected to see the largest growth, numerically, between now and 2020, foreign-born workers, immigrants are over-represented in eight of them. And within the Construction industry, 65% of all “reinforcing iron and rebar” workers are immigrants. They only make up about 15.8% of all US workers, but they account for 20% of all reported injuries. Peter is a fellow blogger with a Harvard MBA, and I have cited some of his blog articles in my online posts, and his blog, Working Immigrants, has been a source of some very important information in the past. He is also a connection of mine on the LinkedIn social media site, and we have corresponded by email in the past. To illustrate just how valuable a source his blog has been, my recent post, E PLURIBUS UNUM: Latin American and Caribbean Immigration, Workers’ Compensation and Medical Tourism, has a table I created from the International Organization for Migration website Peter alerted his readers to. The table appears below. The table is quite self-explanatory, and the grand total of 20.5 million migrants should be of considerable interest to any current or future employer, because those migrants will no doubt have children and grandchildren, and for the foreseeable future, many of them will find their way to employment in those industries like Construction that account for many of the injuries that give rise to workers’ compensation claims. Last November, I wrote a fictional case study, A ‘Case Study’ in Implementing Medical Tourism into Workers’ Compensation, in which I described how a company self-insured for health care and workers’ compensation, could implement medical tourism when three of its employees were hurt on the same job site. I compared the cost of surgeries for both hip and knee replacement in the US with the cost for the same surgeries in Colombia, Costa Rica and Mexico. The table below illustrates the difference in cost between the US and Latin American countries. The figures shown are not the actual costs for these surgeries, but for our purposes, they will suffice to point out the cost savings that are available through medical tourism. So now we have to ask this question, what is the benefit to the injured worker, his employer, your insurance company and to you as the Contractor or Owner of a project covered under a wrap-up? The answer is threefold; one, by having the employee agree to seek treatment for surgery in his former country, in a medical tourism facility that caters to medical tourists, not only will he have the benefit of being treated in an environment that speaks his language and in his culture, or in a similar culture, his friends and family back home in that country can visit him and it will aid in his recovery and return-to-work, but also he and they will have the satisfaction of knowing that he is being treated in the best facility in their country. Second, the cost of airfare and accommodation for the patient and usually one other person, a spouse or friend, is included in the price of the surgery, if going through a facilitator company. And third, with the savings from the cost of the procedure in that medical tourism destination, compared with the cost of that procedure in the US, a portion of that savings can be remitted to the injured worker as an incentive to seek treatment abroad. A number of large and mid-size US companies like American Express, Google, Disney, Phillips Services Industries, etc., are already exploring or offering this option to their employees as part of their employee health plan, but it would be a logical step for workers’ compensation to follow, especially with regard to wrap-up programs in the Construction industry. All that needs to happen is for one or more companies to “get it” and explore medical tourism as an option to the high cost of workers’ compensation surgery. Anyone wishing more information can contact me at richard_krasner@hotmail.com. Feel free to check out my blog at richardkrasner.wordpress.com. This entry was posted in Health Care Costs, Immigrant Workers, Medical Tourism, Workers' Compensation and tagged CCIP, Construction, Medical Tourism, OCIP, Workers' Compensation, Wrap-up on November 21, 2013 by Transforming Workers' Comp. Back in August, I wrote a short piece entitled, Testimonial on Medical Tourism in Mexico. This was based on a comment I received from Patrick Pine, the Chief Administrative Officer at Robert F. Kennedy Medical Plan/Juan De La Cruz Pension Plan, in Bakersfield, CA. I asked Patrick if it was possible for him to get me some testimonials from some of the workers, so that I could write about what they experience when they go across the border for medical care. It took some time for Patrick’s assistant to get me these brief snippets of the workers’ views on Mexican medical care, and it is my intention that this will prove that not only is cross-border health care happening, but that it works for the thousands of agricultural workers and others who labor in the US. While all of them are crossing the border for routine health care, the possibility that they can receive the same quality care at lower costs, if and when, they are injured on the job and require surgery, means that medical tourism can be implemented into workers’ comp, and from what I have been told by at least one former Workers’ Comp expert, it is already happening. We just need to see it expand beyond CA and the other Border States. I am including Patrick’s explanation to me of the workers’ statements with their own words below. Patrick’s words are in bold. I have not deleted or added anything except some minor typographical changes to make it more readable. I am grateful to Patrick and his assistance for their assistance in this effort. Here are some brief comments on employees of US companies – mostly in Southern California – all Hispanic – all are citizens but a spouse may not yet be a citizen or perhaps is a legal resident – most are located in the Blythe area on the California/Arizona border but some are up in Central California. We have a panel of doctors and pharmacies in the Mexicali, MX area that are used with some regularity by various employees and families. But they illustrate in their own words (as translated) what they like about using the providers in Mexico vs. providers in the US. I did minor editing to protect privacy. Me and my wife like to go to Mexicali for our ear problems and the medicine is very good. It fixes our issue really fast without going back and forth and the 20% we have to pay is not as much as it is here in the US. The doctors are really good when giving out medications and treatments. I was being treated in Mexicali because the medicine is more effective, more costly according to some and low amounts of medicine, however; more effective as I get better faster. The cost is much less than here in the US. My wife is being treated here in the US because of Lupus, her doctor is in Loma Linda, however; what they charge is too much and the 20% that we have to pay is too much for us and I have not been able to pay. GXXXXXX is 24 years old and they did not accept the company’s insurance so she has her own insurance. I like to go get better care in Mexicali because I can understand my doctor; I do not have to go over and over again to get medicine as it is more effective. What we have to pay here is better than in the US. In Mexico we don’t have to wait long the medicine and what we get targets our ailment directly. I dare say that if it was not for the insurance my wife would no longer be with me, as she is not able to cross over here to the US because of her illness, and thanks to the Medicine and the care that has been provided by the Doctors and Hospitals here. I have been treated in Mexicali and in the US, for me it is better and cheaper to get treated in Mexico and it is also faster. The medicine is also more effective. I get treated here in the US in case of emergency as it is too far but I rather go there as I can communicate directly with the doctor without a translator. Me and my family get treated in Mexicali as the cost is lower and the medicine is more effective. We like because we also talk to the doctors and with more confidence as they see us more like friends than patients. They ask all kinds of questions over what the problem is and we are very have as of today. 1. Doctor. Consideration, efficiency, respect to patient and they communicate in our language. Diagnosis and the attention required, they pay attention to the required test, the lab work and the necessary treatments. 2. Medical, Prescription and Lab work cost is reasonable. 3. The pharmacy by the name of “xxxxxx xxxxxl” their friendly and efficient service . 4. Lab work turn around and the application of the treatment. 5. Even though it’s an 8 to 9 hour drive from King City to Mexicali we make an effort to go because of the tact and diagnostic. This entry was posted in Immigrant Workers, Medical Tourism, Workers' Compensation and tagged Agricultural workers, California, Cross-Border Health Care, Medical Tourism, Mexico, Testimonials, Workers' Compensation on November 17, 2013 by Transforming Workers' Comp. I received an interesting post today from Peter Rousmaniere’s blog, Working Immigrants, which is described as a weblog about the business of immigrant work: employment, compensation, legal protections, education, mobility, and public policy. Peter’s post, Extraordinary visual of international migration, directs the reader to the website of the International Organization for Migration. What the reader finds there is a map of the world and buttons that allow you to choose between inward and outward migration to and from any country in the world. 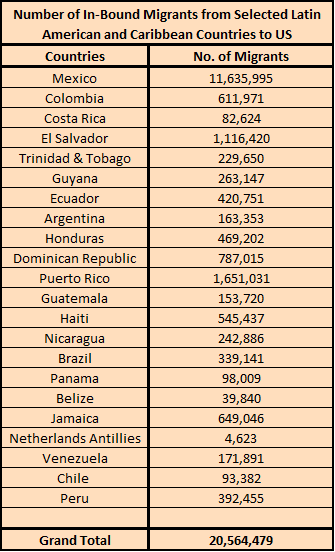 By choosing several countries in Latin America and the Caribbean, I was able to create the following table that shows the country of origin of the migrants and the number of migrants from that country to the US. And here is the key takeaway from the map and the table: The majority of migrants are coming from Mexico, and the total number of migrants to the US from those countries total 20,564,479 million. This number may or may not include undocumented immigrants, and does not include data from The Bahamas, and many of the smaller islands in the Caribbean. But let’s go back to the total number of migrants. 20.5 million is a pretty large number. That is more than the total population of New York, Los Angeles, Chicago, Houston, Philadelphia and Phoenix put together, according to the 2010 census. We can assume that not all of the 20.5 million are able to work or are eligible to receive workers’ compensation benefits, so the number of actual workers out of that 20.5 million is considerably lower. And we can also assume that not all of them will ever file a claim, as I pointed out in an earlier post, Survey says most immigrant workers unaware of Workers’ Compensation: What this means to Workers’ Compensation and Medical Tourism. Yet, for those who do file a claim, it is likely that some of them will suffer an injury that will eventually require expensive surgery that could be found for a lot less in their home countries or in nearby countries, where language and cultural barriers are not an issue. In many cases, these countries are less than four hours from most major cities on the east coast of the US, and no more than 8 hours from other cities, depending on how far south one flies. The question that must be asked is this: If these 20.5 million become permanent residents of the US one day, and have children and grandchildren, wouldn’t it be logical to find a way to provide them with quality medical care at lower prices in their countries of origin, when they are injured on the job, so that their friends and families back home know that they are getting the best care? And what about those in the workforce who are not from that region? Don’t they deserve the same high quality, low cost medical care when they get injured, especially in a location that provides a restful recovery and maybe a little extra on the side? If it sounds like I am repeating myself from earlier posts; yes I am, because it needs repeating over and over again until people realize that health care is globalizing, and workers’ compensation, at least the medical side of it, must be a part of that globalization. Not to do so is, well, you know. This entry was posted in Immigrant Workers, Immigration, Legal Immigration, Medical Tourism, Workers' Compensation and tagged Caribbean, immigration, Latin America, Medical Tourism, Migrants, Workers' Compensation on November 14, 2013 by Transforming Workers' Comp. As many of you may know, I recently observed my one year anniversary as a blogger on the subject of medical tourism and its implementation into workers’ comp. Yet, in that time, I have had very little, if any, positive feedback from anyone in the workers’ comp sector of the insurance industry. Using the social media website, LinkedIn, I have posted my blog articles to groups in either health care, managed care, medical tourism, or workers’ compensation. I have also tried, unsuccessfully to date, to get some individuals I have either connected to, or know of from another connection, to get to discuss my idea. These individuals are heads of companies that service the workers comp industry, so one would naturally assume that they would be interested in what I have to say, and what I have written. And so far, one of them has not even acknowledged receipt of material or letters I have written to them telling them about my idea and why I am contacting them in the first place. Yet again, nothing but silence. I have even been told that I am far in front of the crowd on this subject, which is something I welcome, but would like some company with. Heck, I even had it translated into Spanish. But alas, crickets. I have covered many topics in work comp from employee choice, to the boom in manufacturing, to rising hospital costs, to immigration and immigration reform, to opioid abuse, etc., and still not one word of discussion or debate from anyone in the industry. What little I have gotten in the way of commentary comes from the medical tourism industry. I welcome this, and have gained more knowledge about the industry from these individuals. I am grateful and thankful for their input. Yet, the one industry that I have actually earned a salary in, the workers’ comp industry, has shut their ears, their eyes, and their minds to anything anyone else has to say that might be thought of as “outside the box”. I have heard of some industries being conservative, but being afraid to explore new ideas and new ways of doing things, in light of the constant repetition I see over the same subject day after day, week after week, month after month…”how do we solve the opioid abuse problem?” is being too conservative, and even crazy, as I have stated before. Maybe too many of you are busy doing whatever it is that you do for a living to read your emails, and I have sent many of you emails about my white paper and about my job search, as well as being able to respond to the over 80 posts I have posted to the same LinkedIn groups you and I belong to. But you have no problem discussing drug abuse, physician dispensing, yada, yada, yada, ad infinitum. Would it be so terrible if you at least opened you minds a little and asked me some questions about medical tourism, about how it might be implemented, about what barriers I see or what would need to be put in place for this to be a viable alternative to high cost, poor quality surgeries here in the US? I know I am not the smartest person on earth, but I do have three college degrees, one even in Health Administration. I know times are tough, and I know companies in work comp are being bought up by other companies or by private equity firms, but should that mean that everything grinds to a halt and no one thinks? Does that mean that you just keep doing the same thing over and over again, and expect different results? Well, you know what that is. I have been told on more than one occasion that the industry has to be dragged kicking and screaming into exploring this idea of mine as an alternative. I am not interested in dragging anyone into anything. I just want people to recognize that the world is changing, that the status quo ante is no longer a viable option. One other blogger has said this a few times recently in his blog, so why the industry continues to do business the same way it has always done so, is beyond me. His main point was that the injured worker has been forgotten. My idea remembers the injured worker is a person, a human being, and one who deserves the best medical care possible, even if it is in another country. This is especially true now that the US workforce is increasingly Latino and Caribbean, the closest medical tourism region to the mainland US. Flying time could be under four hours and the cost and quality available is lower and better than at home. If you don’t believe me, check it out yourselves, but I would appreciate being brought into any undertaking in that area; sufficient compensation, of course, is also welcomed. So what say you, workers’ comp industry? Are you willing to open your minds and your horizons to new ideas and new ways of doing things, or are you just going to sit there in your modular cubicles and corner offices doing the same damn things you and many others in the industry have always done with workers’ comp claims? Let me know, I’m eager to find out just how brave and daring some of you are, or are you just prey for the carrion of Wall Street? This entry was posted in Medical Tourism, Workers' Compensation and tagged Medical Tourism, Workers' Compensation on November 11, 2013 by Transforming Workers' Comp.